Many cultures celebrate Christmas in their own way, and Christmas traditions in Italy are no exception. While some practices may be familiar to Americans, Italians do have several traditions of their own that are very different from other Christmas customs around the world. Visitors planning to travel Italy during the holiday season will find that plenty of special events and celebrations are hosted on an annual basis in various towns and villages across the country. A calendar of events from In Italy Online is available, with most special events taking place between December 24 and January 6. While Christmas traditions in Italy are showing signs of westernization, customs from years past have managed to stand the test of time. Different regions and families may choose to incorporate various aspects of the old traditions with new traditions, just as holiday celebrations in the U.S. vary from house-to-house and state-to-state. The main form of Christmas decoration found in Italy is not the Christmas tree, but instead the Nativity scene. 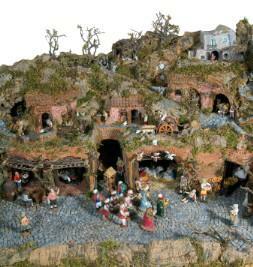 Called presepio or prespi, these scenes are often intricately detailed and are in churches and towns across the country. From live scenes to scenes that include modern world figures to simple wooden cutouts, the Nativity scenes are as diverse as the people in the country. Zampognari are traveling musicians, often bagpipers and flutists, who travel across Italy during the holiday season. Originally shepherds, these men stop in front of Nativity scenes, playing traditional Christmas carols. Today, they can still be heard on the streets of many Italian towns in their traditional garb. December 24, or Christmas Eve day, is usually one of vegetarian dishes for Italians. They eat fish, especially eels, for the 24 hours before midnight mass. Cardoni is a popular vegetarian dish served on the holiday. Christmas Day meals usually feature lamb or roasts as the main dish. Desserts might include traditional fare like panettone, a light cake. Panforte is a cake with chocolate flavors, spices and nuts. Although some children receive gifts from Babbo Natale, Father Christmas, on Christmas Eve or morning, most still eagerly await the visit from La Befana. Arriving on January 6, legend has it that La Befana is a witch who heard of the good news of Jesus' birth from the Wise Men. Either unable or unwilling to travel with them, she eventually started looking for Jesus but never found Him. Instead of giving her gifts to the newborn baby, she instead leaves them for children across Italy as she searches for Jesus. Christmas stockings are hung in anticipation of her arrival, just as they are hung for Santa in the U.S. Bad little children are said to receive coal or nasty vegetables in their stockings, just as American custom dictates. Christmas traditions in Italy are ones that embrace the religious aspect of the holiday, with the focus on prespi, and less on the commercial aspects. Like Americans, music and special food means a lot to the Italians during the Christmas season. January 6 (Epiphany) is an important day for Christmas gift giving.